On Sunday morning we bumped into Bonneville Dam. We didn’t know we were looking for a lecture on hydroelectricity, but we were jolly glad we found it. Bonneville Dam is a triumph of state and international cooperation. 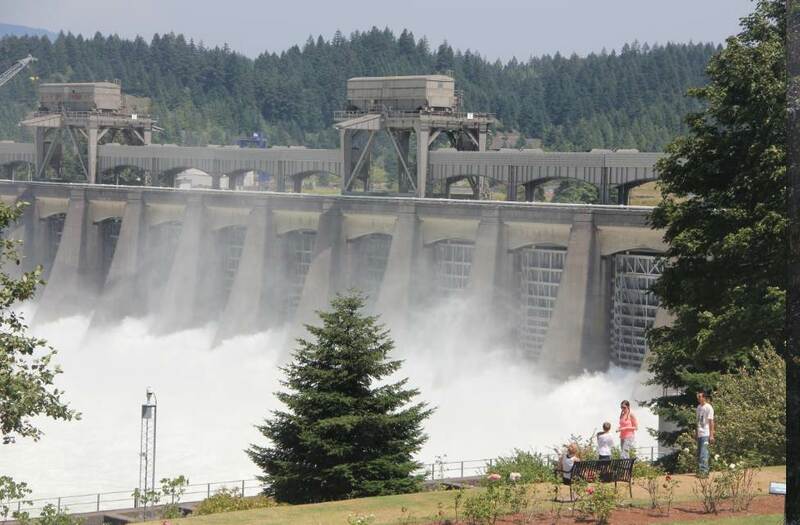 It’s the major component in the system of dams on the Columbia River that provides electricity for the whole of Oregon, and parts of California and Washington too. The dam was built in the 1930s, when America used public works to buy the country out of recession. The Columbia river (and its tributaries) is dammed along its length, from Canada to its estuary into the Pacific, resulting in a need for communication across several state borders as well as with Canada. Water flow is managed upriver to such a fine degree that the amount of water approaching Bonneville Dam is never a surprise. The advantage of this is that electricity can be produced efficiently at every dam along the way, with the right amount being produced to satisfy demand. A fish ladder. The salmon can jump or swim up each step individually, rather than having to scale a whole dam. While this was all very fascinating, what really caught our attention was the other side of operation. Damming causes problems for salmon that are trying to run upstream to spawn and die. The fish would have to pole vault to get past a huge concrete dam, and they don’t appear to have evolved the ability to do that yet. 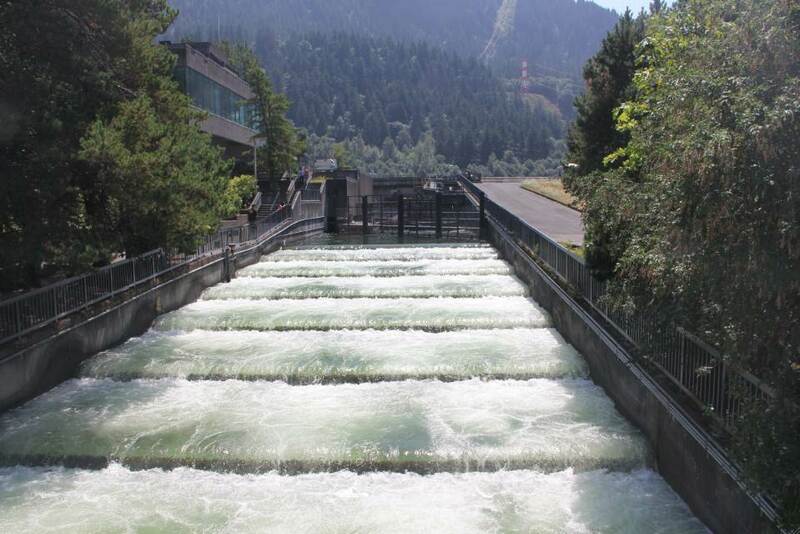 So, instead, Bonneville Dam has fish ladders, which provide easier access upstream. In the Autumn, salmon can be seen leaping over each step of the ladder, but August isn’t the peak of the running season and we didn’t see jumpers. 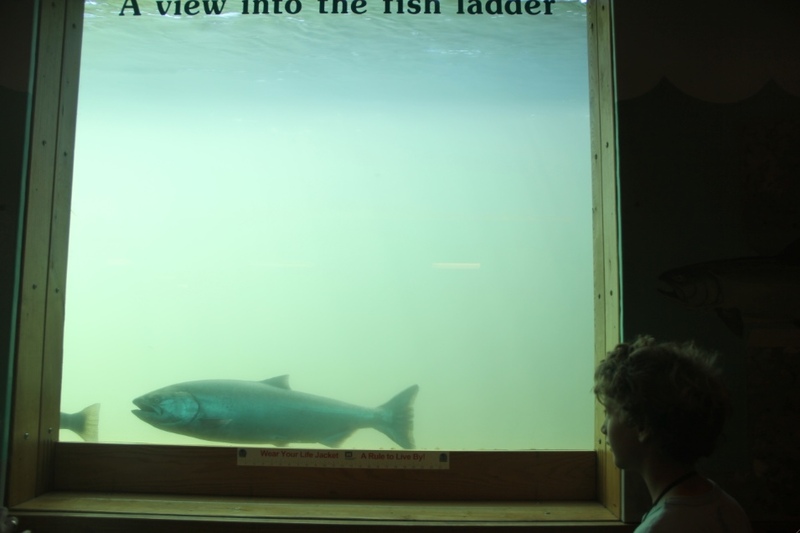 Max is watching a chinook salmon through the fish ladder window, from a downstairs viewing hall. What we did see was a sign telling us that 4,167 coho salmon had come through the fish ladder the day before. How, we asked, could they be so precise about the number? Ah, came the reply, the fish are corralled through a narrow passage with a window and someone downstairs sits in a cubicle on the other side of the window and counts them. With only a 10 minute break each hour. For eight hours. Straight. All day. In shifts. The fish counter sits in a private cubicle and can’t be disturbed. But the dam kindly provided a picture of what the role looks like. 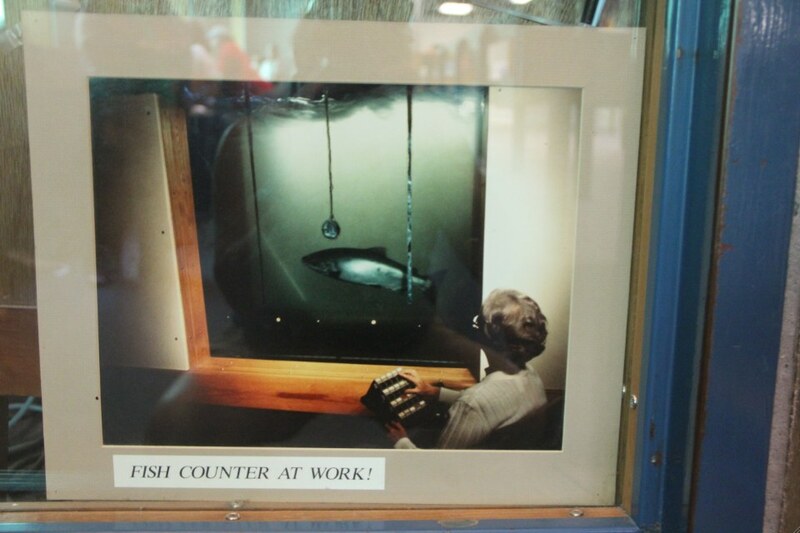 Here’s a counter with an abacus-thingy to keep track of the different species of fish. Yawn. Several different types of salmon, trout and lamprey come through the fish ladder and each species has to be counted separately. Some fish turn around and swim back past the window, so have to be subtracted from the number and recounted when they come back again. And it’s very important that the absolute, exact, precise, definite number of each type of fish is counted properly because sustainability information and fishing quotas are calculated from these totals. I can only imagine how unbelievably tedious the job of fish-counter must be. no more tedious than checking chicks for wobbly bits or whatever you did on the Kibbutz!